Branding is a buzzword that “suits” stay away from, right? In niches where the product is “less than glamorous” (like Charmin toilet paper), brands with “brand characters” (such as the Charmin bear) increased digital engagement in ads by 585%. Across niches, from selling hotel rooms, to selling paintings, telling the actual story behind each product or service increased the “perceived value” of the sold item or service from 5% to 64%. Still a skeptic? Cue, Exhibit A: A brief but effective study on 10 legal firms and their ability to not only carve out but stand out in a crowded marketplace. Bick Law LLP is “exclusively environmental” but it’s not their tagline that captures the imagination. 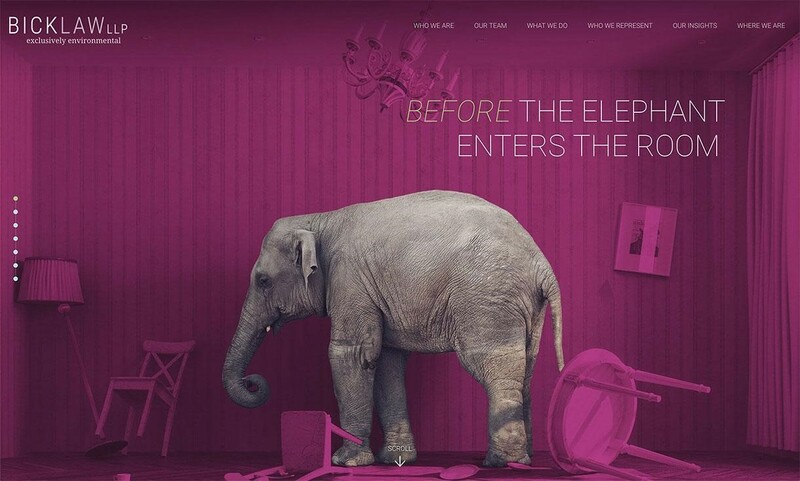 Rather, it’s the impactful use of color overlays coupled with whimsical but pointed imagery of animals in a corporate setting. Comprised of a tight team of five lawyers, this legal brand’s “story” is clear: We’re legal animals, focused on making big change through our legal services. Specificity of services, perceived brand value and divergent thinking are clearly all enhanced through definitive visual imagery of the header images. This definitive promise sets the tone for the rest of the brand’s copy, from its mission statement to its headlines, to its approach to clients. It’s not about beating the competition but, rather, setting themselves apart from it. The whole point of mediation, dispute resolution or arbitration is to get both parties to give a little, make a move and compromise. 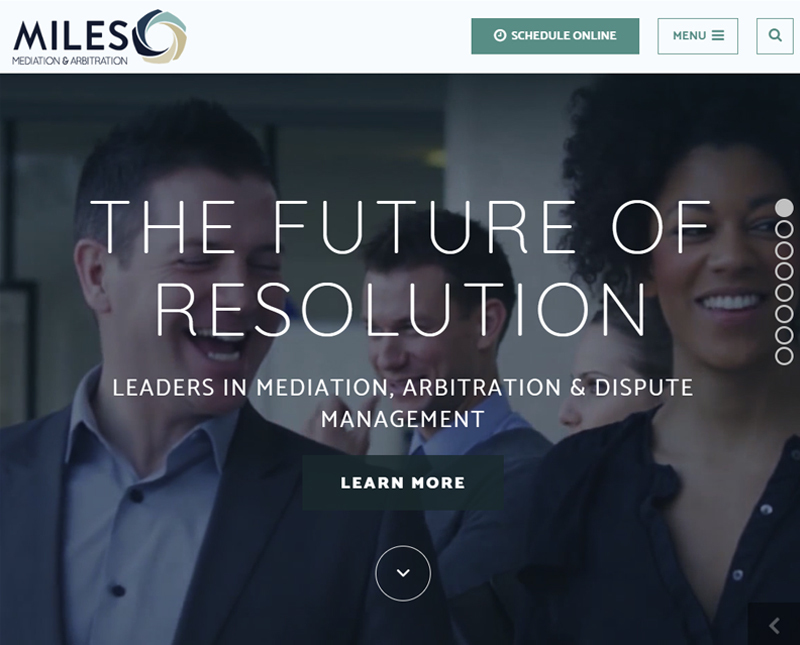 So it makes perfect sense that Miles Mediation weaves movement, through movable graphic elements, animation and video, throughout its website. By making a choice to incorporate animated and video elements through its headers, as well as streamlined scrolling and typefaces, there is a subtle and implicit acknowledgment that dispute resolution involves real, live people and their priorities, which are themselves ever-shifting. The story of Miles Mediation tells the client that these are the elements of successful dispute resolution and mediation that matter most. Impactful typography that makes a visual, as well as an ideational mark on your audience, is an ideal way to tell the story of a brand. Even if a website’s functionality remains simple, the typographic elements, especially through the use of headers and taglines, can instantly capture your attention the way that Employers’ Legal Defense Institute does. 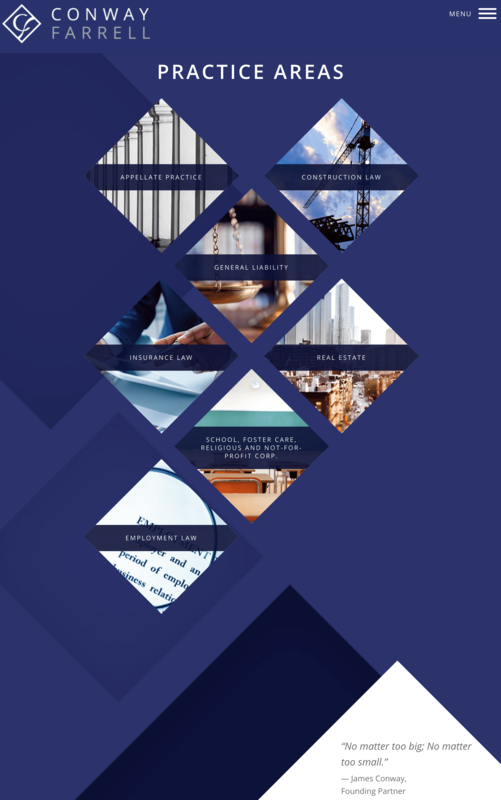 Kaplin Stewart is a firm focused on diverse but interconnected legal offerings like Commercial Litigation, Business and Corporate Law, Environmental Law, Real Estates Transactional and more. They’re almost a full-service law firm but, to tell their particular story and stand out, the legal brand has decided to commit to a homepage design that simply exudes authority and size. That’s why they’ve decided to use bold, large-scale and high-resolution images and to divvy up the website’s scrolling into smooth sections, incorporating anchors in each section to focus the reader’s attention. You don’t have to look any further than this homepage to get a sense that Kaplin Stewart’s “trading capital” is the fact that they’re Goliath in a town of Davids. In the digital age, case management has more than a few opportunities for a revamp. And that’s what “Case Anywhere“, an online service for legal case management offers attorneys and those related to the administrative aspects of day-to-day case handling. Here, it’s not the website design or visual identity that stands out. Instead, it’s the service that stands out because it’s peripherally related to the more niche aspects of legal management and services. The employees of a law firm — partners, associates, peripheral staff like assistants and paralegals — are part of the legal brand’s story. These are the names and faces, the stories of the people behind the firm. By featuring them right away, Buckalew Frizzell + Crevina LLP immediately trade on the reputation and expertise of their attorneys. Here, it’s about people and the lawyers working for the client. Instead of allowing their user to scroll through a “landing page” format of a homepage, Dickie McCamey & Chilcote decided to work with headers. And the very first header showcases a background of people. The next header slide is all about their “new office”. The headers continue through animation, scrolling from a video message from the president, to DMC Law in the community, to the services they perform and then over to their history. By varying these “slides” and mixing current events and news in the local community, along with the workplace culture and brand history, DMC Law is telling clients exactly what they prioritize: teamwork and serving local clients through professionalism and experience. Conway, Farrell, Curtin & Kelly focuses on a mix of business, construction, non-profit and general liability legal services. As such, they’ve decided to keep their functionality clean by confining the page to a simple header and navigation menu. Simple functionality guides the client or user through an uncomplicated navigation experience. The user “experience” of the website allows these complex and often “big” areas of law to instead be the focus. It’s not about frills at Conway Farrell and their choice of functionality highlights this. Words matter — and lawyers know this better than most. It’s why Evert Weatherby Houff, otherwise known as “EWH Law” guides their website visitor through a story that focuses on grabbing attention with copy. Each section of the site focuses on bringing the headlines to the fore, guiding the eye and giving the mind a significant “idea” to chew on, before moving on to the explanatory copy. These are headlines like “Proven Leader in Asbestos, Products Liability and Toxic Tort Litigation” and “Local Presence, National Scope” as well as, “Experienced and Dedicated Legal Team”. This succinct and declarative style of copywriting tells the implicit story that EWH is just as direct and definitive when it comes to complex and large-scale problems like asbestos or toxic tort. Don’t make the mistake of thinking that highly specialized or technical services like legal niches can’t be either compelling or creative. These 10 legal firms prove the opposite! As long as you have the creative and functional aspects of storytelling intact — visual identity, brand and workplace culture, design, copy, and functionality, to name a few — your legal firm can make an impact. Done right, your story should make a case to your ideal client. We’ll leave the actual arguments to you, but contact us if you’re looking for ways to stand out in a crowded legal marketplace online.